Gertrude always had dreams of owning her own business but never thought it was possible. She largely depended on her husband’s income to support her family living in Uganda. Her six children fell in and out of school, often dropping out for long periods of time because they couldn’t afford their school fees. 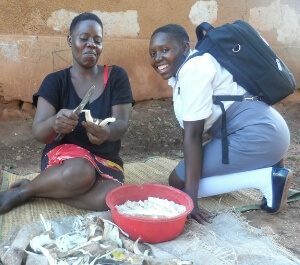 Determined to keep her children in school, Gertrude received small business training through Canadian Feed The Children’s local partner HUYSLINCI. She also learned how to grow fruit and vegetables through small-scale gardening. She would feed her children with the produce from the garden and sell off the rest to her neighbours. 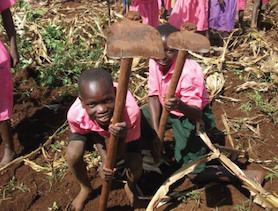 “The money I earned from my small gardening helped me buy my children uniforms, books, and other school supplies. I regret all the time it took me to start earning my own money,” Gertrude said with a laugh. It wasn’t perfect but having both incomes helped the family get by. That is, until Gertrude’s whole world came crashing down around her. Sadly, a few short years later her husband passed away suddenly. Without his support, Gertrude knew that a small garden couldn’t support her children alone. She decided that she needed to take charge of her future and expand her garden into a fully fledged business. 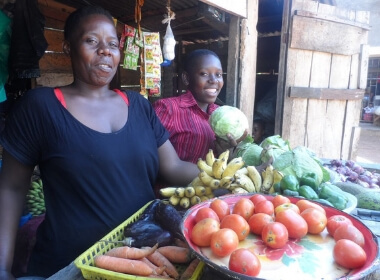 After receiving a grant from HUYSLINCI, she rented a kiosk in her local market, paying for three months rent upfront as well as buying produce and gardening inputs. 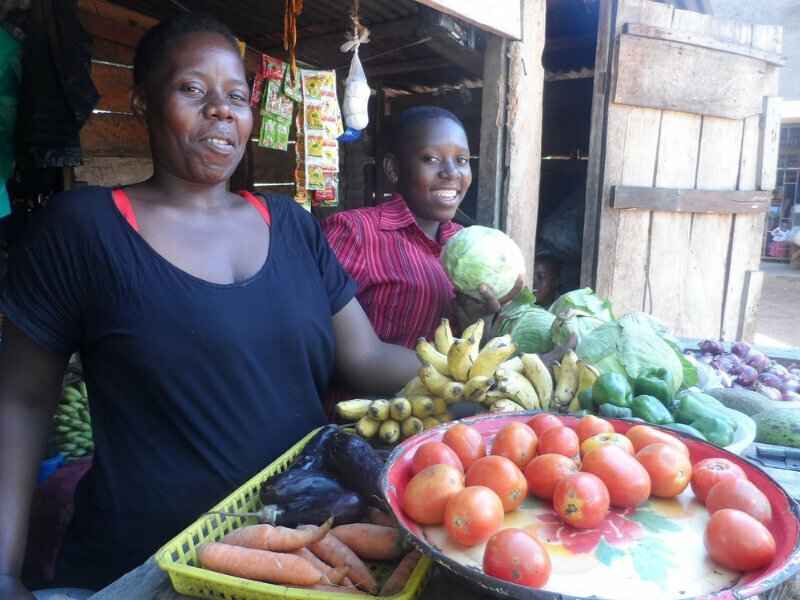 Gertrude believes that a grocery shop is the perfect business for her – she can sell her produce for money as well as eat and cook with the leftover vegetables. “Opening up this shop was something I had long dreamed of. This is my passion,” Gertrude told us, proudly. 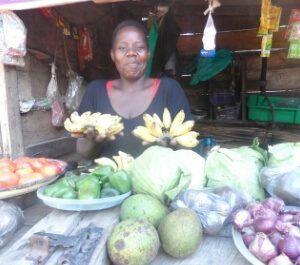 Gertrude purchased wholesale produce like cassava, green bananas, tomatoes, carrots and onions to sell in the local market from her kiosk. Her stall is so popular that there are times when customers will come to her house after hours asking to buy her vegetables. 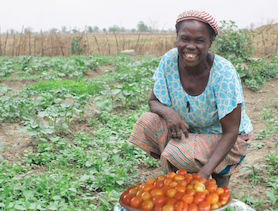 Once Gertrude’s business started to thrive, she asked three of her neighbours to grow their own vegetables and sell them at her kiosk for a reasonable price. Now their families benefit from the extra income too. Gertrude’s tenacity during hard times has paid off, giving back all she can to ensure her family stays healthy and happy. Her children are all enrolled in school, eating healthy and nutritious meals and haven’t been sick in months. In the future, Gertrude dreams of buying the kiosk she rents to take complete ownership of her business, as well as expanding the acreage of her garden. She would even love to open a restaurant with friends and completely supply all the produce. This farming combo provides a sustainable source of food and income, with garden tools, seeds and training to start a home garden.